Over the subsequent week, Koudelka took dozens of street photos capturing Czech citizens’ passionate, non-violent resistance to the military takeover of their country. The negatives that got smuggled out made their way to the offices of the Magnum photo agency, and the images soon appeared (anonymously credited to “P.P.,” short for “Prague Photographer”) in the Sunday Times of London and Look magazine in the United States. Koudelka did not publicly acknowledge the work as his own until 1984. 22 years after the attack, in the first August after the Soviet-backed Communist regime relinquished power, Czechoslovakia’s leading cultural and political newsweekly Respekt put Koudelka’s wristwatch photo on the cover of a special edition devoted to the ’68 invasion. The photos from that traumatic week (along with a recording of Walter Cronkite’s CBS news report one year later, which prominently featured the images) are a primary focal point of the retrospective Josef Koudelka: Nationality Doubtful, currently showing at the Getty Museum. After he fled Czechoslovakia for asylum in England in 1970, Koudelka became formally stateless for an extended period, even as he continued to wander around Europe taking pictures. Whenever he returned to his home base in Britain, his papers were marked “N.D.” for “Nationality Doubtful” at the border. Koudelka eventually settled in France, where he is now a naturalized citizen. Aside from the singular occasion when events forced him into the role, Koudelka was not really a photojournalist. The Getty show presents well over 100 prints from various phases of his career, which began when he worked as a photographer for theater companies in Prague in the late 1950s. He first attained international renown in the mid-1960s for Gypsies, his book of photos depicting life in Czechoslovakia’s Roma communities. The photos from Koudelka’s periods of international wandering in the 1970s and 1980s, his “exiles” as he has called them, include a diverse and moving array of candid scenes in the U.K., Italy, Ireland, France, Germany, and Spain. 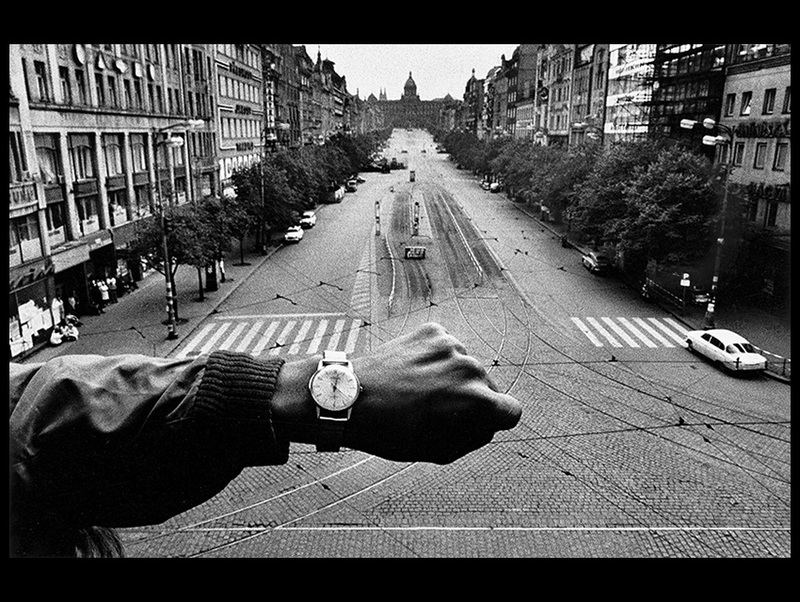 In one striking 1976 image, the photographer wryly recreated his famous Prague wristwatch shot with an empty Spanish landscape in the background. The exhibition concludes with a series of Koudelka’s recent work with panoramic cameras, showing dramatically unpopulated vistas in Israel–Palestine, archaeological sites around the Middle East, and stark regions of the European landscape. One of the most memorable images in Nationality Doubtful captures a scene from Theo Angelopoulos’s 1995 film Ulysses’ Gaze, in which a gigantic toppled Romanian statue of Vladimir Lenin is transported down a river toward oblivion.